PLEASE NOTE: We do not offer a next day delivery service online. If you need next day, please contact us on 01423 503319. Goods are dispatched same day, before 2pm (Monday to Friday) when in stock. "Turmeric supplement is great. My greyhound now has a spring in her step. Highly recommended." "This is good for our pets. Will continue to use "
"This is definitely a treat! Would be great with dark chocolate 😉"
"Easy to get our dog to take them he thinks of them as treats and they help him with his shoulder which he injured when he was a puppy"
"My dog has really flourished on this and it is so easy to order and it comes so quickly so definitely a 5 star service." "Fantastic both my gsds have it every day easy to use and no mess"
"It was for my dog. It has helped her immensely. Will keep her on it for a long while, before, during and after her operation. So impressed, thinking of getting some for myself"
"I have noticed a great improvement in my dog. He is 12.5 and was struggling with stiffness and mild arthritis. This product has been great. Will be ordering again. 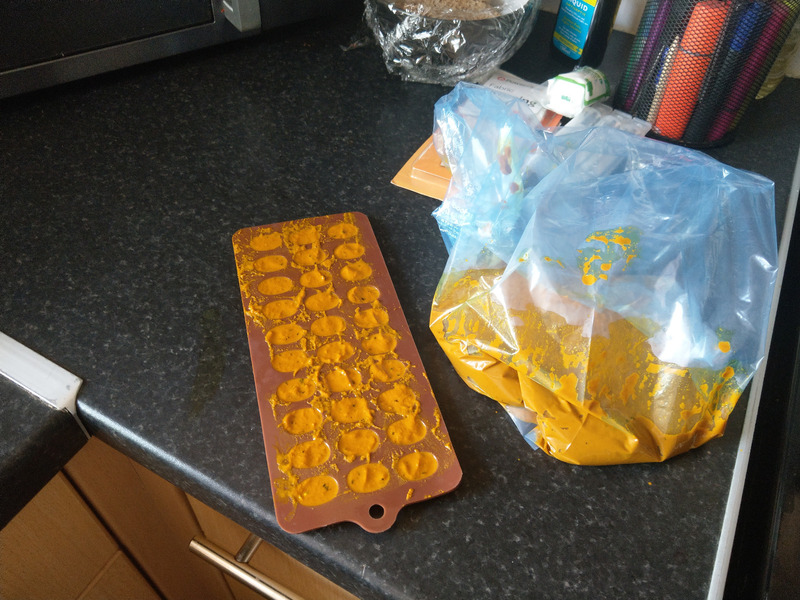 Highly recommended "
"Wonderfully easy way to get your active turmeric. " "Did my research first and this seemed a good buy. My dogs absolutely love them, worth every penny"
"Very helpful when I asked for advise on my dogs current medication. Fast delivery and will definitely be purchasing again. It is a bit early to tell what difference it has made but by following the gradual increase has meant no upset tummies." "No mess due to product being in pellet form and product arrived well packaged "
"The dog love's these raw chicken slices. I cannot recommend highly enough. The dogs coat skin and well begin has improved beyond belief. Thank you the Golden Paste Company"
"I bought this for my dog Rosie as she was diagnosed with inflammation in her spinal cord and could just say walk and walked with her head down, not like proud Shih Tzu does. Rosie has been taking 1 slice x twice a day, I thought she would struggle to eat them due to the smell however Rosie and my other 3 fussy Shih Tzu's ate them. Rosie is now walking much better after taking these for 2 weeks (in my view this has helped greatly). Once I run out which will be a while as there is a lot in that little tin I will be purchasing her more." "I am so very impressed with this product, I have now purchased the human version for myself (and some of the chocolate which tastes incredible!) My Shetland Sheepdog competes at a high level in agility as part of Team GB and in major events throughout the year. I like him to be on the same supplements that make me feel good, but unfortunately I just could not get him to eat Turmeric in any form. 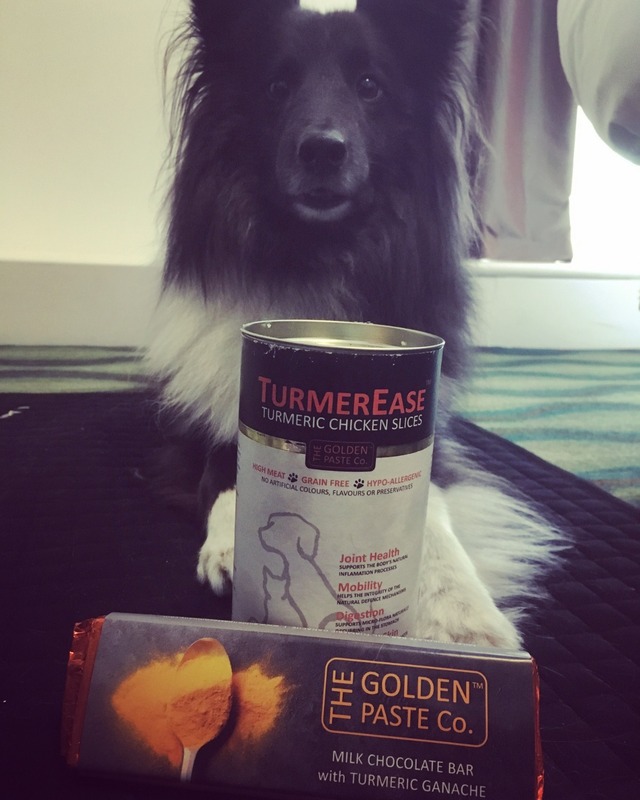 Luckily I met the team at The Golden Paste Co. at Crufts who offered him one of the Turmereze pellets which he ate immediately.. and then asked for more!! He has been on it since and even went on to win the Championship agility event at Crufts after :) THANK YOU so much for this fantastic product which both my dogs now happily eat every day :)"
"Really pleased with the effect it's had on my 7 year old dog, who had an on/off limp for ages. Since being on Golden Paste, we've had no lameness. Really pleased too with the product, conveniently packaged and received very quickly after ordering. " "Ideally packaged in pouches and so easy to dispense.Both my dogs adore it !" "This product has made a vast improvement to my Westie Maisie"
"Exactly what I needed to create correct dose for my home made GP. Prompt delivery, would recommend & will use site again." "I am very happy with the company and the paste. Too soon to know if it will help me though." "Easy to use pouch. I have seen such an improvement in my dog." "My 6 year old Labrador was getting stiff after lying down. After only a few weeks using the paste she has improved significantly. " "I’ve been giving my beloved jack russell x these treats (originally the fish based sausage) and now these for over a year as well as Yumove advanced and hydro sessions every two weeks and his shoulder stiffness just on getting up early morning is now hardly noticeable and we still manage to do 3 mile walks at a good pace and he can jump up on the bed happily even though we built him some steps. He also is totally addicted to my golden milk made from the paste. As soon as I make mine he sits drooling waiting to get the last drops from my mug which I save for him. I think our animals instinctively know what’s good for them and are drawn to it. I love buying it ready made as I already make his food weekly so it’s nice to have it ready made in the fridge. Great Co with speedy delivery too." "Highly recommended. I have been taking these capsules for about 2 weeks now and the discomfort in my hip has most definitely eased. The only slight quibble is the strong peppery after-taste but I understand this has to be present for the best ingestion of the turmeric. Getting used to it now!!" "Thought it would be nice to add a small amount of crunch to their wet raw food in the evenings. Both my dogs love it. Having the added turmeric is a bonus to. Thank you"
"My 14 yr old Border collie started to struggle to get up, following a few doses of Golden paste... know like a 2year old! !… but just creaking a bit!" "Very good thank you. " Be the first to learn about exclusive discounts.